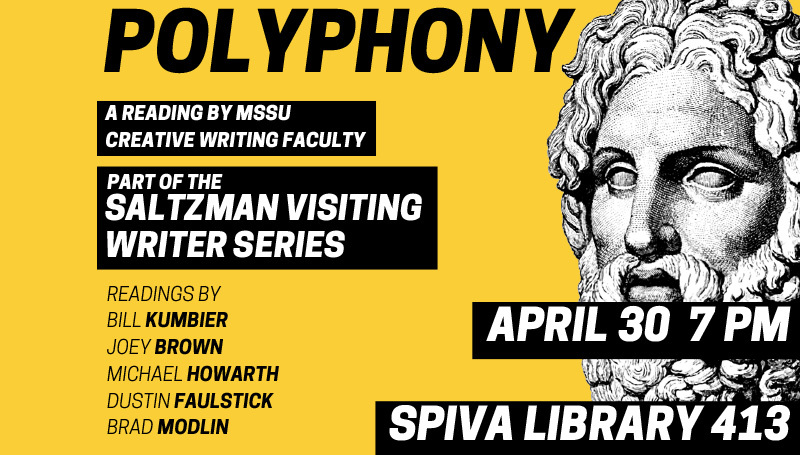 The Department of English & Philosophy will present Polyphony at 7 p.m. Monday in the Spiva Library quiet room. The evening will feature readings of original poetry and nonfiction by creative writing faculty members Bill Kumbier, Dustin Faulstick, Brad Modlin, Michael Howarth and Joey Brown. Refreshments will be served. There is no charge for admission, though contributions to the Saltzman Visiting Writers Series will be welcome.